To understand how PIM DM works, just look at control messages generated. NAP is a Huawei proprietary protocol, which implements remote configuration in Layer 3 networks. It allows to log into an unconfigured device from a directly connected device. It is very simple and can be really helpful, when implementing new devices. NAP establishes a temporary neighbor relationship between configured and unconfigured devices. Both must be directly connected through a physical link. When NAP relationship is established, telnet can be done to the unconfigured device. Statically – using IP addresses allocated by the administrator. NAP cannot be used on interfaces, configured with commands affecting the IP address configuration or IP packet forwarding, such as commands related to VPNs or Ethernet trunks. Configure IP addresses based on the above topology (omitted). 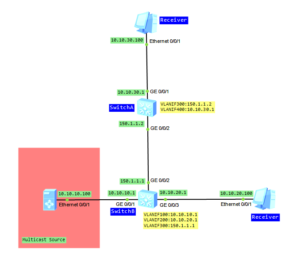 Use OSPF to assure connectivity between switches. Enable PIM DM on all interfaces. As you can see this post so probably new DNS servers started working correctly. What’s new here on labnario? In addition to a new look, a technical forum has been published. You can write your questions, describe technical problems or just talk about everything and nothing in Hyde Park category. It depends on you if this forum meets its goal. I wouldn’t like to close it due to a little activity. As I see, such a fate befalls most technical forums on the internet. I count on your activity here on the forum. Let’s build a forum of which we can be proud of. I’m still working to properly assign links on the blog. Most of links direct you to the old blog. It will be changed ASAP. As it was not possible to move all posts from the old blog automatically, I had to do this manually. That’s why there is a significant probability of mistakes. If you find them, just let me know. Some time ago I wrote about local PBR and interface PBR. It’s time to talk about routing policy, that is a different mechanism. Routing policy is applied to routing information and it is combined with routing protocols to form policies. PBR mechanism is applied to data flows and and packets are forwarded according to the configured policy. Routing policy is a tool which can be used to filter routes and set route attributes, when importing routing information into OSPF, RIP, ISIS or BGP protocols. BGP can use routing policy to filter advertising routes as well. Routing policy defines which of the routes from the specific routing protocol are allowed to be imported into the target routing protocol. It can be also used to match routes or certain route attributes and to change these attributes when the matching rules are met.